Know your fish and their habits - behavior, feeding. Avoid any permanent stress, particularly from mixing fish that are incompatible due to their size or behavior, or from a lack of shelters and hiding places. Do not introduce new fish directly into the aquarium. 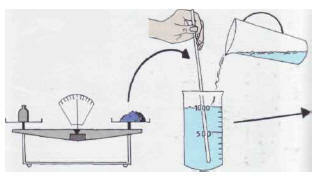 Powders such as copper sulfate and methylene blue are weighed and then diluted in water to form a mother solution. There are a great many medicines on the market, specifically formulated for one or several diseases. Constant progress is being made in this field, with new medication for marine fish also being produced in the last few years. It is important to respect the instructions regarding both the dosage and the treatment schedule. Bacterial diseases can be combated with antibiotics. However, the use of these substances, which are difficult to obtain, is not recommended, and could lead to the creation of resistant strains. Various chemical products can be used in treatment, provided the dosages are fully adhered to. Firstly, and only to be used in fresh water, there is kitchen salt, which is effective in certain cases. It must be added gradually to the water until a level of 5-10 g/liter is reached, but this dose must not be exceeded. Once the fish is cured, the water is returned to its initial unsalted state, by means of successive changes of 25% of the volume of the tank per day. Methylene blue is efficacious against fungi. Dissolve 1 g of powder - which can still be found in some pharmacies - into 1 liter of water. Treat fish with 0.5-1 ml/liter of this solution, and eggs with 1 ml/liter. The product is then eliminated through gradual changes of 25% of the volume of water. Methylene blue cannot be used in sea water. Malachite green is particularly effective against fungi, but also against ichthyophthyriasis (white spot disease). A solution of 1.5 g per 10 liters is prepared just before use. and the treatment should not last more than 2 hours. A The quantity required for treatment is taken from the bottle on the left, which can then be stored. Formol is active against external parasites. A commercially available 40% solution of formaldehyde is used, after diluting at the rate of 20 ml/100 liters of water. Generally speaking, 15-20 minutes of treatment is sufficient, but in any case it must never exceed 30 minutes. The treatment can be repeated twice, at 48 hour intervals. (Copper sulfate is often used in sea water, but it is toxic for invertebrates and some plants. The ailing fishes must therefore be treated in a hospital aquarium if they are not the sole occupants of the marine tank. 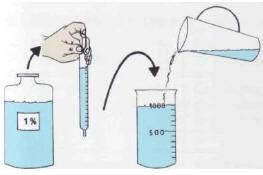 Dissolve 16 g of the crystals into 1 liter of water; the treatment dose is 10 ml of this dilution per 100 liters of water. As a precaution, the product's introduction into the water can be spread out over one day. The dilutions of methylene blue, malachite green, and copper sulfate must be carried out with distilled water. All these products, apart from the salt, must be kept in a cool, dark place - ideally, in the refrigerator. However, be aware of any possible dangers, especially to children, who might be attracted by the colored liquids formed by copper sulfate and methylene blue. ВОДОЭМУЛЬСИОННЫЕ КРАСКИ , то же, что эмульсионные краски.